Brought to you by Random House and written by Stacy McAnulty, this fun Goldie Blox middle grade novel series is sure to inspire the next generation of little-makers! in to lead the look and feel of the series. This became one of my favorite projects I've ever worked on. Best Pet Ever Cover Only. Goldie blox ruins the school! The first installment of Goldie Blox's book series happened in the middle of a major design style change at Goldieblox HQ. 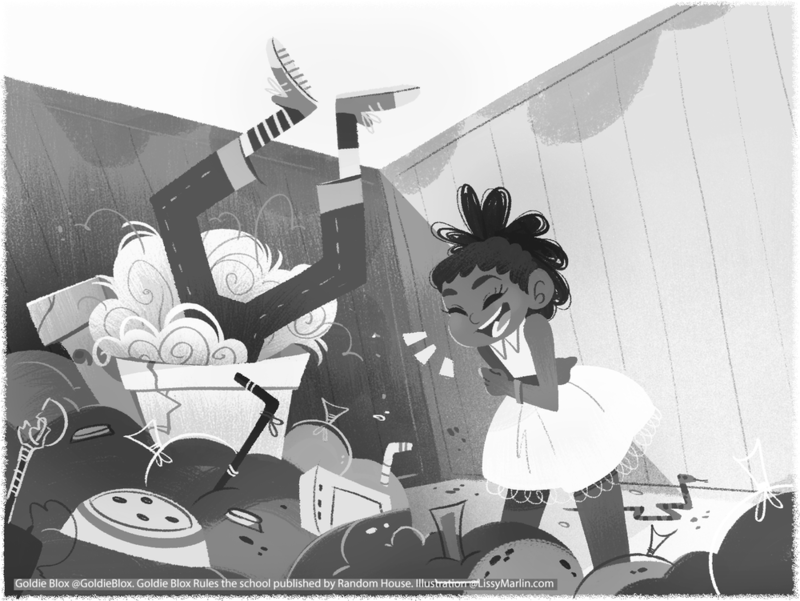 At the time, I had the task of exploring different illustration styles for Goldie Blox and the gang, therefore one of the primary challenges we faced was determining the style of the book series. This is the reason why the first sketches of the book looked radically different from the final look of the series. The first few passes of the cover were under the art direction of Jenna Boyd, the rest happened under the creative direction of Jennifer Raharjanoto. When Jennifer Rahadjanoto joined the GoldieBlox team she pushed the style even further in order for it to look more within the reams of animation. In order to do this, new cover ideas were explored until we landed at a sketch that was more aligned with the feeling of the book and Debbie Sterling's vision for the series. The interiors for Goldie Blox Ruins the School were, perhaps, my favorite part of the whole process as I learned a lot. The brief called for the interiors to look fresh, dynamic and contemporary. These were quite challenging as I had to step out of my comfort zone but the result speaks volumes! On a rare occasion, however, not only did I work on the cover of Best friend Fail, I also illustrated the interiors. Goldie Blox and her friends!